I’m making you a miso soup that’s hearty enough for a meal! I know, another miso soup. I just shared this chicken-less miso soup with you a few weeks ago, but I also wanted to have a version that was more traditional. I love a good miso soup and almost always order a cup whenever we head out for sushi. Miso soup, seaweed salad and a roll is one of my favorite meals, especially when I’m traveling. The only downside about miso soup is that it’s always an appetizer. Delicious as a first course but definitely not filling enough to make a meal. Well, we’re changing that today. 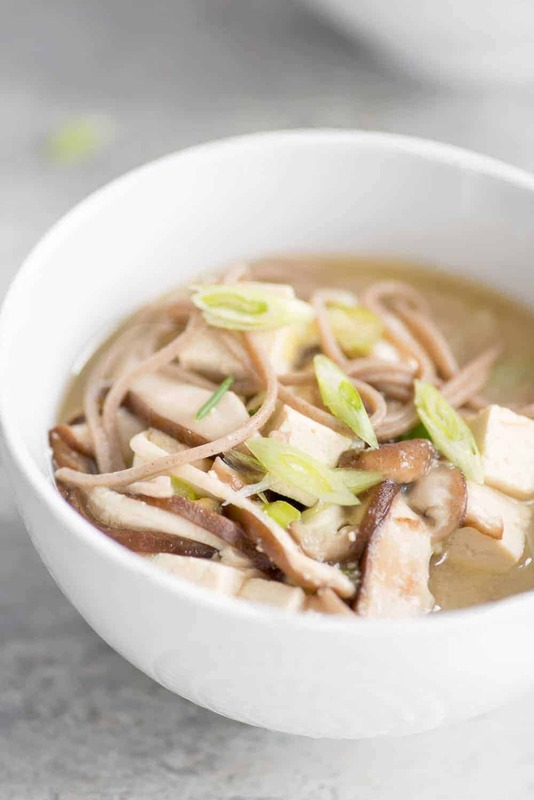 This miso soup has bok choy, shiitake mushrooms, tofu and chewy buckwheat noodles. We’ve been enjoying this one over and over again for a light dinner and it’s so delicious, Van loves it too. I drain the broth off it and let him slurp down the noodles. Miso soup is made with (you guessed it) miso, which is a traditional Japanese seasoning made from fermented soybeans. Fermented foods, like kimchi, yogurt, kombucha, pickles, tempeh, and miso, contain good-for-you, naturally occurring bacteria, also known as probiotics. Probiotics help to restore the naturally occurring bacteria in your gut by kicking out the bad bacteria (that can accumulate from a processed diet, high in fat and sugar) and resetting it with the good stuff. Probiotics have a whole host of health benefits – everything from boosting the immune system to soothing digestive upset, to supporting metabolism. 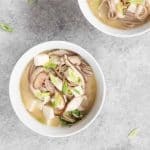 And if probiotics weren’t enough of an immune system boost for you, this soup is also packed with fresh ginger and shiitake mushrooms, both of which have immune-boosting properties. Have I mentioned this soup is deliciously comforting? The miso packs in a ton of flavor that is complemented with the spicy ginger, the mild bitterness of the green onion and bok choy. 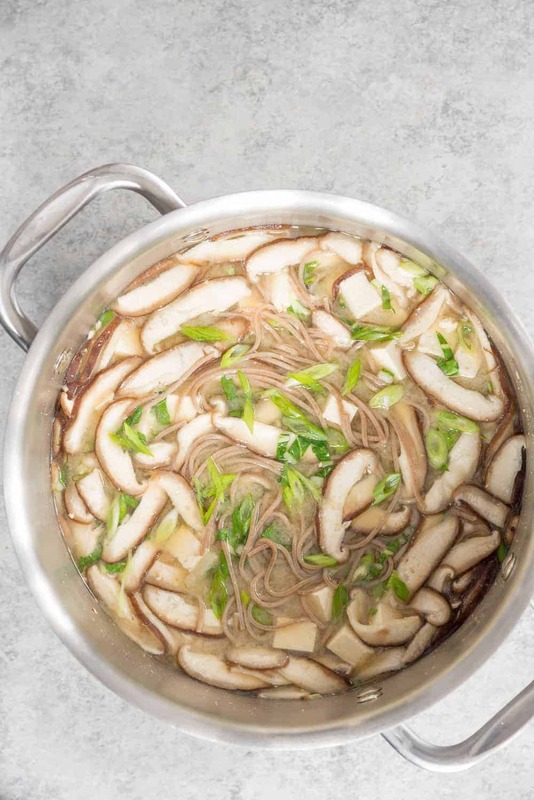 Plus, it’s super satisfying with the meaty texture of the mushrooms, protein-packed tofu, and fiber-packed buckwheat soba noodles. This version is vegan-friendly too (traditional miso soup broth calls for dried fish flakes) and super easy to make. You can find kombu online or in Asian grocery stores/specialty stores. I grab mine at Whole Foods! 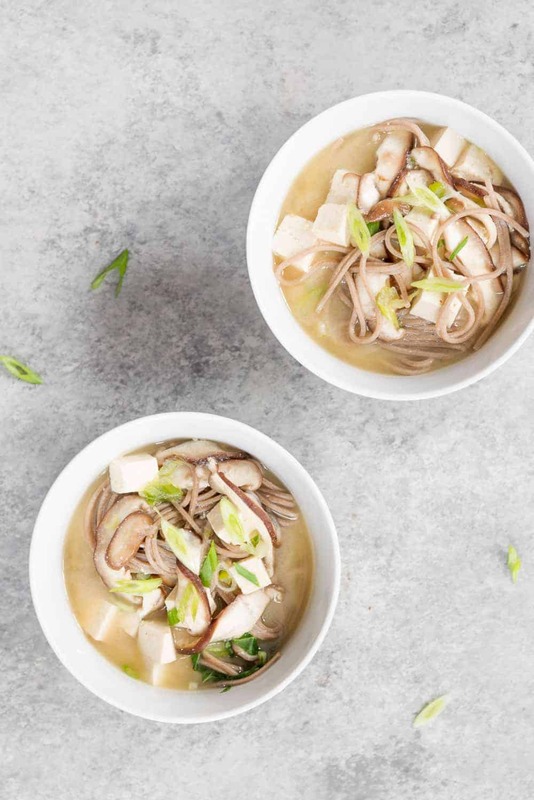 Packed with immune-boosting functional foods like miso, ginger, and mushrooms, this vegan miso soup is one not to miss during the winter months. For the Dashi (broth): Fill a large pot with water and add kombu, dried mushrooms, and ginger. Turn heat on to medium and let cook until just before the water begins to boil. Turn off the heat and remove the kombu, mushrooms and ginger with a slotted spoon. For the Miso Soup: While the dashi is still hot, reserve about 1 cup and mix with the miso in a bowl until miso is smooth consistency, free of any lumps. In a separate pot, cook the soba noodles according to the directions on the package (about 7 minutes in boiling water). Continue to heat the dashi over medium heat and add the garlic, kale/bok choy, mushrooms, ginger, and tofu. Let cook until kale begins to soften but before it gets too wilted, about 5-10 minutes. Turn off heat and whisk back the reserved miso broth. Separate the soba noodles into bowls for serving. Pour the miso soup over the noodles. Garnish with green onion. Note: If you have extra time and want to make a more flavorful Dashi, soak the kombu in the pot of water for about 3 hours before heating it with the other ingredients. I know you can technically slice the dried mushrooms after they have been cooked in the broth and add back to the soup, but I really dislike the flavor of cooked from dried mushrooms. Therefore, I add fresh ones! Wow. This looks amazing. I haven’t used some of those ingredients before so I may be in for a fun trip to HMart! That looks Sooooo good right now! I’m all things soup since the cold weather and this is a great addition…..
yum, yum, yum! and Umami! Delicious! I used 3 kinds of dried mushrooms, and replaced the tofu and kale with napa cabbage. YUM!!! Thanks so much for the recipe. Vegan soup is one of the recipe I can cook. Perfect in any kind of occasion which enhance the appetizer of my guest. Of course, it is also perfect for my home menu. My kids love it. That is just what I need right now. I didn’t know about not boiling the miso. Now I know. The finished product looks delicious. Thank you so much. Thumbs up.